Solid wood chairs with maximum seating comfort. 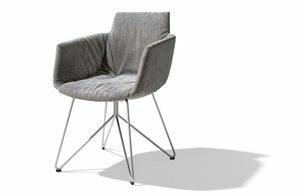 Ergonomics, comfort, and durability are the Alpha and Omega of our chairs. That is why they are tested comprehensively from the development stage onwards at our in-house test lab. Whether four-legged, cantilever, or swivel base, our chairs guarantee a comfortable and relaxed seating position for long and leisurely times at the table. And with almost limitless design options, our leather, natural leather, fabric, Stricktex and Softstrick covers will always be a talking point.